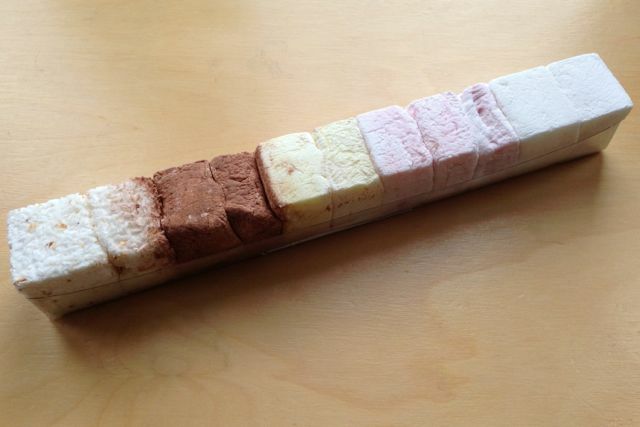 The marshmallows come in an elongated pack with everything stacked in a line, which is an original idea that shows off the various colours. Would be even better if you could get them to actually send them to their customers. A recurring theme seems to be no response to email, contact form or even phone calls AND not bothering to send the products out despite swiftly taking the cash via Paypal. Still waiting for any response from them at all. We've contacted Sweet Vegan and will let you know if we get a reply. You will be lucky, I have been ringing them, emailing them and have now raised as a Paypal dispute. Sweet Vegan have responded to us this morning. They say that you will be refunded your payment and also still receive the goods. Carmen from Sweet Vegan apologises about the delayed response which was due to illness. 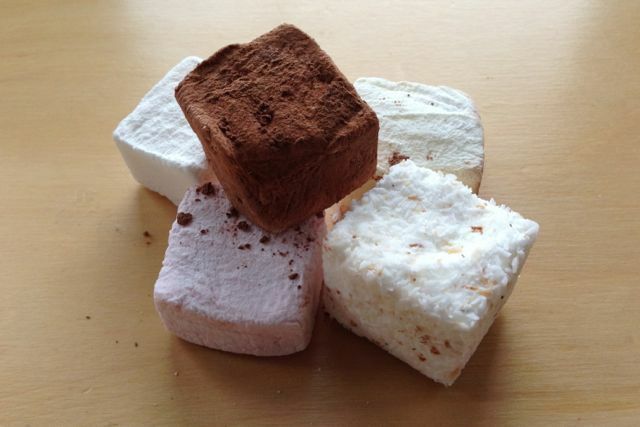 The company wishes to stress that all marshmallows are made to order and customers should allow three weeks for delivery (as stated on their website). Goods are normally despatched in a week. I ordered from sweet vegan over 4 weeks ago, been charged but yet to receive the goods - have e-mailed and no response. Just an answer machine when I phone! Okay... bit of a theme here. We'll endeavour to contact the company again. Me too, have emailed three times just get the same automatic response. Appalling treating customers this way and yes they've had my money too, over £20! Really disappointed! Brought three packs of marshmallows with had long dates on them. Ate one pack and then kept to until later. Well in the best before date and they went bad - I had kept as directed on packaging. Contacted Carmen, told 2 months ago I would receive a replacement. Nothing! Even after contacting on some occasions - no response. 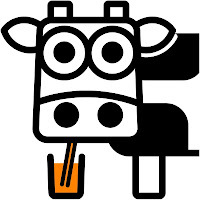 I really liked the product and now feel as though I cannot place any future orders with them! Shame because they were a good find. I ordered a few different types of marshmallow on the 12th of April. They were to help me recuperate from major surgery, I needed all the help I could get with getting as many calories as I could. My marshmallows have never arrived. I've tried to call and email Carmen but have not received a reply let alone a refund. To say I'm disappointed is an understatement. Is there any other way to contact Carmen about my order? Cherie, thanks for adding to the growing list of comments here. Whenever we've emailed Carmen she has responded straight away, so we know they're getting through. No idea what to suggest to resolve the situation though. We'll ask Carmen to comment here again. Got a circular e-mail from sweet vagan last week stating that all orders to 29th November have been dispatched, maybe get a delivery this week - but wont hold my breath!! Thanks for the update. 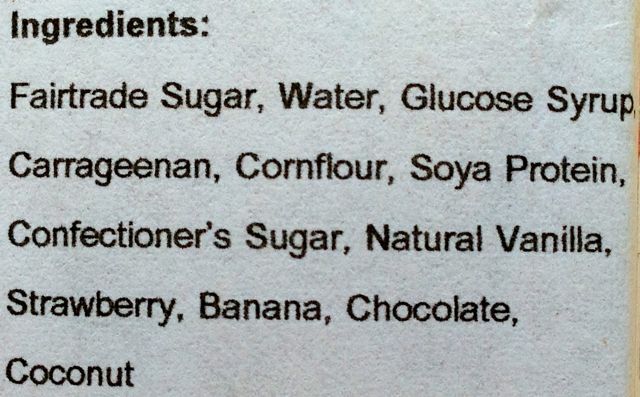 We emailed Sweet Vegan on Friday, but as yet we've had no response to our request for comment on these complaints. If any of my customers have any problem with their order please email me so we can sort it out. Carmen, as you can see from this thread, we have been e-mailing you but you never reply. it seems the only way of getting your attention is to write on here!! "All orders placed up to the 29th November have been posted out this week. All orders placed from 30th will be going out next week. you will get them in time for Christmas!" OK folks, please no more anonymous comments. Carmen has assured me that she is responding to emails on a daily basis and doesn't wish to respond to anonymous comments on here. If you are genuinely not getting a response within a reasonable time, then please comment by logging in first. You can use any Google ID such as G+, Gmail or Blogger, or you can also log in with a Wordpress ID, AIM or OpenID. Please include the date of your order. awesome ! thank you to provide the best service to the customers and to make the good excellent marshmallows, with a great texture.i am so shocked because i like this very much. I never did receive the marshmallows. Such a shame as I know for a fact they are absolutely delicious. Placed order on 17th May for birthday present, money taken straight away. Birthday has come and gone, 6 weeks later still waiting for the order. Emailed 25th June and got an automated email explaining the are struggling to cope due to a free postage offer, according to their website this was offered 21/22 May. Not sure why this would hold up my order which was placed before the promotion. No other response from company - if I haven't heard by early next week I will raise a dispute with PayPal. I've been waiting since May for my order. I have emailed twice in the last 2 weeks asking for a refund as it has been too long and have heard absolutely nothing from them. Seems to be a common thing that they don't care enough about their customers for even a courtesy email to say they have at least read it. And like everyone else they took my money straight away. 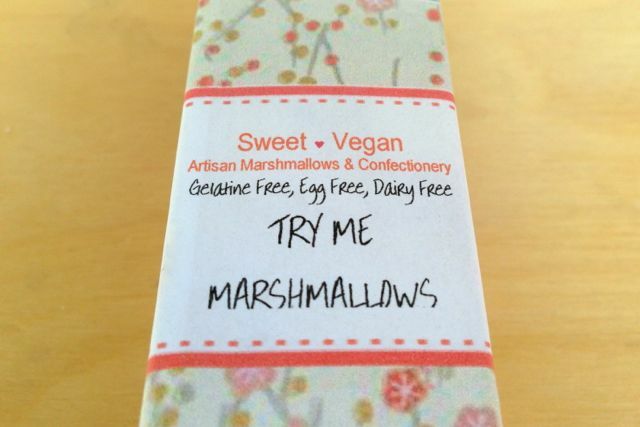 Sweet Vegan is now trading as Marshmallow Deli, but beyond a new name nothing has changed. They take your money and then make weak excuses for ridiculous delays. Really frustrating to receive a promotional newsletter encouraging new orders when existing orders clearly haven't been sent out. Still not received my order from the beginning of September. Ordered over 3 weeks ago, so far no response to emails and no marshmallows or even set delivery date. Very disappointed, I've ordered from lots of places before and never had this issue. I ordered almost a month ago now.No reply to emails querying what's happening. Took the money sure enough though. I've read all the above comments and can only say it's sad when there seems such disregard for other people. I experience feeling from my situation and reading the other comments above a betrayal of trust of people's good will and willingness to support that business. Ordered almost a month ago now.No Reply to emails querying what's happening. Took the money sure enough though. I've read all the above comments and can only say it's sad when there is such disregard for other people. Such a betrayal of trust and exploitation of people's good will and support of that business. I can't seem to get Google to display my name here. My name is Inez de Miranda, and I live in the U.K. I too ordered from Marshmallow Deli over a month ago, and have not received my marshmallows. I just sent an email to them, so I still hope to get a reply. That said, some time (years) ago I ordered from Sweet Vegan, never received my order, and got no reply to my many emails and phonecalls. The phone was even answered once, but after I said what I was calling for she hung up on me. I only managed to get my money back when I took it to Paypal and settled it as a Paypal dispute. Never received my marshmallows. I ordered on the 1/6. Have emailled twice, no reply, so have now opened a PayPal dispute. I had a couple of orders from them previously with no problem, but this time they have lost my custom. Appaling communication skills, so despite a good product i would advise people not to use them. It looks like Marshmallow Deli still have customer service issues. We suggest using PayPal when making a purchase as refunds are no quibble if the dispute isn't contested. I placed an order on the 5th of June, I wasn't in a hurry so I didn't mind waiting a bit, but I have now waited closer to 3 month than 3 weeks for my order. I have emailed them twice, both times with no reply, so I am now going to try and get a refund through PayPal. I ordered from them once before a few years ago and got that order with only a few weeks wait, but that was just for a box of standard vanilla marshmallows. I wondered at the time of placing my most recent order how a small company could manage producing so many flavours, and I guess this answers my question - they can't. 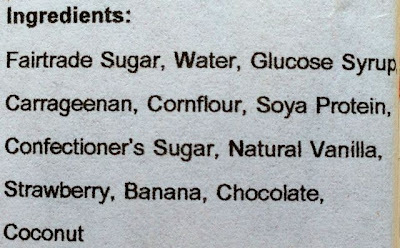 I am curious to know though whether the problem is completely random, or if it is only with orders that contain more unusual (less often ordered) flavours. I have a feeling they are trying to be too ambitious and are taking on a lot more than they can handle, that I can excuse, the bad customer service though, I can't. I've been waiting for over a month for my order from Marshmallow Deli. Wish I'd read these comments sooner. Wondering whether it's worth reporting them to Trading Standards? Did you use PayPal? If so you can get a refund pretty quickly. I've been waiting over 7 weeks for my order and have sent two emails but had no response for either of them. The money was taken from my account two days after I placed my order. These were supposed to be a Christmas present for my mom but looks like they'll now have to be her Mothers Day present instead. It's a real shame as these marshmallows are delicious and I have had delays in the delivery before but not this extreme. I'd appreciate a response please Carmen. I regret buying from this company. 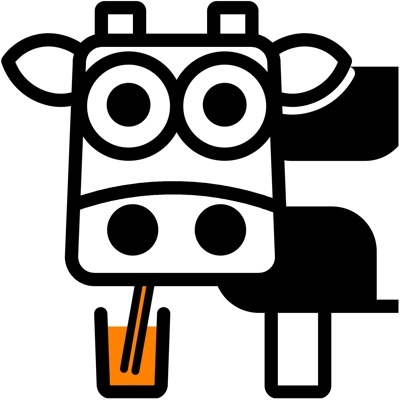 Although I've had the products before and loved them the service is not good. I ordered a birthday present for someone and have now been waiting over a month. Not as long as some of you but I emailed multiple times and each time it was down to the hot weather and she said it was being posted out ...and each time is hasn't! She's very polite but each email reply has given me hope and then it still doesn't arrive. The moment has gone now for my friends birthday who still hasn't had a present off me. Why can't this company offer a chilled postage, I would have been happy to pay a bit more for it to arrive on time. I wish i had found theze reviews earlier....ordered last year and didnt get them apparently she was dying from carbon monoxide poisoning and i was more borhered about my order than her :) anyway decided she may have got her act together and sorted herself out so ordered again on the 11th Nov its now the 22nd Dec and no marshmallows ! Cant believe she has been doing this for years...its a scam and needs sorting ! I need to speak to someone so she gets closed down ! Dont think i paid via paypal now just cards so going to b3 good getting my money back !!! Did you ever receive your order? I ordered a few weeks ago and am now getting worried that it may never be fulfilled. Just to add to other comments, order placed on 2 Feb 17, still has not arrived after 8 weeks. Received a reply to emails, first said it was at the post office, second 2 weeks later said was ready to post out. Still no parcel, 3rd email has not been replied to after a week. Website says about delays etc and will be replying to emails. Understand some wait, but being told different things is is frustrating. Also, it is frustrating that I keep getting emails advertising Easter products with special discounts when still waiting for Valentines Day Products! Please be aware, they are no longer using PayPal, they use Shopify, have contacted shopify, if you want a refund you have to raise refund with Marshmallow deli or contact your bank. Pity, as it is such a great product when you actually receive it. I placed an order on 05/03/2017 and never received same. Multiple emails requesting updates since have been ignored. I requested a refund on 14/04/2017, which Carmen agreed to provide on 24/04/2017. It has been radio silence since and no refund has been received. Carmen has ignored two further emails I have sent after she agreed to process a refund. She had advised earlier that health problems were resulting in delays in processing orders. To be quite frank, this is not my problem. If one is incapable of fulfilling orders in a timely fashion, then promises should not be made to do so. Carmen is more than happy to accept payment in a very timely fashion but it's like pulling teeth when a problem needs to be resolved. I also placed an order #377 on 26-5-17 and have had no reply to emails requesting an update!Payment was taken off on placing my order. I have ordered in the past and loved the marshmallows but I will not be orderering again or recommending them to any of my friends. I also ordered some products during the free postage promotion. Two months and 3 emails later I'm still waiting for my marshmallows. I will be following Chrissieanne's suggestion and contacting my bank tomorrow! Finally some progress! On Sunday I received an email from Marshmallow Deli about a new P&P promotion. EXCUSE ME?! After I'd calmed down I replied to this email and said I'd appreciate the items I ordered during the last promotion that had not yet materialise and an answer to at least one of the several emails I'd sent asking for the progress of this order! Today (Tuesday) I received an unbelievably chirpy email from Carmen apologising for the delay due to illness (sound familiar?) but the items will be with me this week. 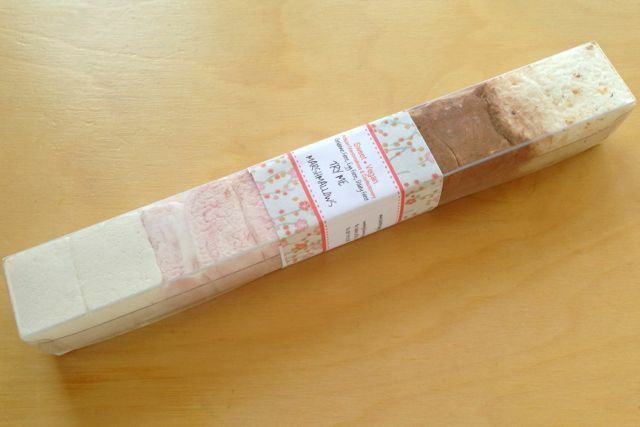 I have found a new company who make vegan marshmallows (Ananda Foods) which seem to have very good reviews so I think I'll give them a go next time. Anandas marshmallows taste more like tofu than marshmallow, but her service is far better. It's a sad fact that Carmen makes the best marshmallows but is terrible at customer service! Chrissieanne, I'm glad you're finally getting yours too! Well, it's taken month since the email promising me my marshmallows 'by the end of the week, but they FINALLY arrived today! I asked for refund, which got a swift response saying she'd sent out' several packages'that day, so I asked for a copy of her proof of posting so I could check with my local sorting office. When I looked at the box, it had YESTERDAY'S posting date on it,so she'd told yet another unnecessary fib. Glad you got them in the end, Gaina! Just wondering- has anyone ever check the actual vegan authenticity of her marshmallows? Like in a lab? I struggle to see how they are the most amazing etc etc if every other vegan mallow company struggles to make anywhere near as tasty and squishy and nice mallows ? Just a thought !! Ordered for summer bbq 2017 it's now January 2018. Nothing. Same old story as above. I didn't pay by PayPal so gutted I've lost money to this unreputable company. Very sad. I'm so sorry you've had this experience. I assume your PayPal is linked to your bank account? If so I would raise a dispute with both,as anyone who takes your money and doesn't send an item is committng an offence. I had to get quite stroppy with her before she finally sent the marshmallows, so don't be afraid to tell her you're prepared to tank action if you don't get a refund - that got things moving for me. Good luck! Victoria, I’d report her to trading standards in Nottingham. Carmen has not changed. I've had the same issues as everyone above. The marshmallows never arrived, and customer service was awful. I got a standard email, stating my order had been sent (my order was a Christmas present with guaranteed delivery if placed before the 17th of December)but I never received it. Eventually I got an order saying, your order has been cancelled, 2 days before Christmas , no explanation. Carmen then put a promotion up on the internet, is free postage encouraging Christmas sales, shocking as she clearly hadnt sent orders from months before, why increase a work load she can't handle. I had to send several emails before she agreed to refund me and then what I was told was to raise a dispute with Paypal to get my money back. I did this and she escalated it to a claim. PayPal then contacted me and said if I didn't produce evidence they would fall in theh business owners favour. After more emails to Carmen asking why she just didn't refund me, instead of making me fight for my money, she emailed saying this was the only process. I know this isn't true as I've instantly issued refunds on PayPal myself, there's no need to dispute. I honestly think she needs shutting down,shes not trading in a fair way. Does anyone know how to get this useless, cheating woman put out of business? She is stealing money. She is a liar and I would have thought this thread alone given to trading standards would be enough for them to act. I don't know where to start but I will support anyone who does and wants to make a case. As far as producing evidence she didn't send them to you, Victoria, how can you prove a negative???? She needs to be made to produce the proof of posting that she did send them. Evidence she clearly does not have. I, too, have issued many partial refunds on PP when I have charged too much for shipping, It can be done, and easily too. She is a fraudster of the first order and it STILL getting away with theft. After all these years. We could try BBC Watchdog or similar and see if they're interested in taking it up? That is a good idea! Nursing my dad nearly full time so would support anyone actually getting in touch with Watchdog...this woman needs to be stopped from trading. Not all her products are vegan now. Sorry to hear the same problems are still happening in 2019.
i have received 3 previous orders but none within the 5-7 day timeframe she quotes!! more like 5 months ... i dont know why we are all being enticed by this woman to give her our money, its only the fabulous product I suppose!! Is there anything happening re. Watchdog or taking some kind of action against her? I'm not sure if it would have more impact if they got several emails fron individuals about the same company or we got our heads together and composed one email. It is a shame they’re the best marshmallows around, because the business is awful to deal with. Sounds good. It's been 2 years since I last ordered so I think it's better if people with more recent grievances email first, but I'm happy to add my experience once the ball gets rolling.